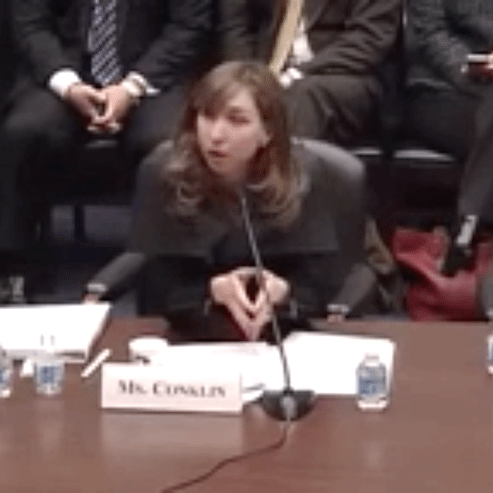 Kristin Hultquist (formerly Conklin), HCM founding partner, addressed ways to simplify the federal financial aid system before committees in the House and Senate. Kristin spoke to her work with The American Dream 2.0 Coalition and a technical panel HCM convened, which recommended ways to put student success at the center of federal financial aid investments. Her testimony called for one grant, one loan and one tax benefit program, with new incentives to promote innovation and student success. “I firmly believe that financial aid clears the path to the American Dream,” Hultquist said. “Simplifying the financial aid application, eligibility and repayment processes can help more students without breaking the bank.” With over 60 questions on the FAFSA, four different grant programs and five different loan programs, as many as 2 million students never even apply for student aid. Create one grant, one loan, one tax benefit — Simplify financial aid with a single federal grant program and a single loan program. The current system has four different grant programs and five different loan programs—each with their own criteria, standards, lengths of time, and repayment terms. Consolidate all household-based tuition and fee tax credits and deductions into one Lifetime Learning Credit. Promote shared responsibility for completion — For students, this means making college more affordable by removing the 12-credit per term cap that currently is on maximum federal aid awards and prevents lower-income students from completing their credentials on-time. For institutions, this means maintaining minimum levels of student access and success with a set of balanced metrics. Fund demonstration programs — The federal government should invest in demonstration programs that spur innovation and experimentation. The American Dream 2.0 coalition included such diverse national leaders as Mark Morial of the National Urban League, Robert Reischauer, former director of the Congressional Budget Office and President of the Urban Institute, Eduardo Padron of Miami Dade College and Purdue University President Mitch Daniels, former governor of Indiana. HCM’s technical panel of experts built on the coalition’s work and their report, Doing Better for More Students, includes the most comprehensive modeling of impacts and options of any aid financial aid report, led by technical panel member Dr. Kim Rueben of the Urban Institute. These reports, as well as others supported by grants from the Bill & Melinda Gates Foundation to 14 other organizations, can be found at americandream2-0.com. Please visit the Committee Hearing Website.